GRANADA, Spain (CIS) – Canada’s snowboard team made its lone appearance at the Sierra Nevada resort Tuesday as the parallel giant slalom competition took place at the 27th Winter Universiade. Canada’s best medal hopeful, Burlington, Ont.’s Darren Gardner, qualified for the head-to-head 1/8 final in sixth position overall but was unable to get past Andrey Pepelyaev of Russia in the round of 16. The Quest University student had to make up a quarter-second on the final run of the day to advance to the quarter-final round but was disqualified after missing a gate and finished in ninth position overall at the Sulayr Snowpark. Teammate Olivier Vachon of Quebec City was the final qualifier to the 1/8 finals but he too failed to advance past his head-to-head competition, Austria’s Alexander Payer, and ended up in 16th place. The third Canadian in the men’s event, Jules Lefebvre of Montreal, finished 21st in the qualification round and did not advance. On the women’s side, Queen’s University’s Megan Farrell of Richmond Hill, Ont., the lone Canadian entrant, finished 21st in qualification and did not advance to the knockout stage. 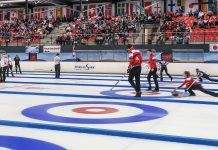 Elsewhere in Canadian action at the biennial FISU Games, the Canadian women’s curling team wrapped up a perfect round robin while the men found themselves in a fight for their playoff lives. Skip Breanne Meakin’s Carleton University-based rink of third Lauren Horton (Almonte, Ont. ), second Lynn Kreviazuk (Ottawa) and lead Jessica Armstrong (Ottawa) put up a five-ender in the eighth to get past the United States by an 11-4 score Tuesday, putting the finishing touches on just the third perfect 9-0 round-robin record since curling made its Universiade debut in 2003. The top seed in the playoff round, Meakin (Winnipeg) and her squad will face either South Korea or Switzerland in the semi-final round on Thursday after those two teams play a tiebreaking match Wednesday to decide fourth place. In men’s curling action, the University of Manitoba team skipped by Winnipeg’s Matt Dunstone fell 10-3 to Sweden in a forgettable morning draw, setting up a situation where Canada needed to defeat Japan in its final round robin game, and hope for a loss by either Sweden or Great Britain to keep their playoff chances alive. Dunstone’s rink of Jim Coleman (Winnipeg), Daniel Grant (Winnipeg) and Chris Gallant (Charlottetown) held up their end of the bargain with a 7-5 win over Japan to finish with a 5-4 record. However, Sweden defeated the Czech Republic 11-3 while Great Britain got past Switzerland 8-4 in the final draw, giving both 6-3 records and berths into the semi-finals. Canada, therefore, finishes fifth in the round robin and does not advance. The stretch drive to the end of the Universiade begins in earnest Wednesday with multiple Canadian teams in action. On the ice, Canada’s women’s hockey team (1-1) faces Japan (2-0) in a semi-final at 1:30 p.m. local (7:30 a.m. EST), while the Canadian men face the United States in a quarter-final matchup at 8:30 p.m. local (2:30 p.m. EST), live on www.fisu.tv. Next door at the Universiade Igloo, the short track speed skating competition gets underway with the 1500-metre finals and the heats in the women’s 3,000-metre and men’s 5,000-metre relays, while up in the mountains the women’s giant slalom takes centre stage in alpine skiing at Sierra Nevada. Canada (9-0) finishes first in round robin, advances to semifinals on Thursday, Feb. 12 at 3 a.m. EST (9 a.m. local time) vs. South Korea or Switzerland. Canada (5-4) finishes fifth, does not advance to the semi-final round. 21. Megan Farrell, Richmond Hill, Ont., 1:05.85, does not advance. 6. Darren Gardner, Burlington, Ont., 54.55, advances to 1/8 finals; 16. Olivier Vachon, Quebec City, Que., 57.53, advances to 1/8 finals; 21. Jules Lefebvre, Montreal, Que., 1:00.21, does not advance. Darren Gardner, Burlington, Ont., loses to Andrey Pepelyaev, Russia, finishes 9th overall; Olivier Vachon, Quebec City, Que., loses to Alexander Payer, Austria, finishes 16th overall.